A cold front will be approaching the ArkLaTex today and combined with an upper level system will increase rain chances starting later today. Heavy rain and downpours are possible, but the severe weather threat stays low, that’s the good news. 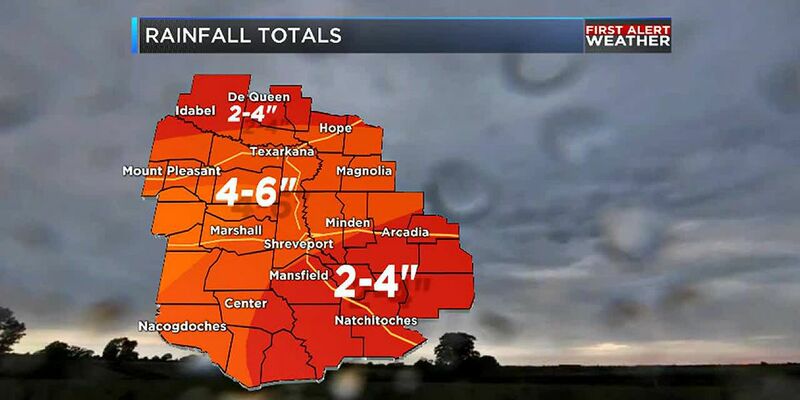 The bad news is that the Weather Prediction Center is staying with their forecast over the past few days and expanded the area that could receive upwards of 6 inches of rainfall throughout the area. Overcast conditions can be expected today, but there is an increasing chance of seeing scattered showers throughout the day. Temperatures only in the low to mid 50s across the area, so make sure to grab the jacket. Keep the umbrella handy just in case too. Rain chances increase as we head into tonight and overnight. Friday morning we we could see heavy downpours across the area, this could impact your morning commute. Give yourself a few extra minutes. Rain will become more widespread throughout the day. You will need the umbrella all day long. If you aren’t seeing rain, expect cloudy conditions. Rain could be heavy at times which could reduce visibility on the roadways, so be careful. Highs tomorrow in the low 50s. Here’s a breakdown of Futuretrack from Meteorologist Kalie Pluchel. Upper 40s is all we go on Saturday, due to continuing rain chances in the forecast. Widespread rain is what you will be waking up to, becoming more scattered throughout the day. Rain chances stay low in the evening on Saturday, but not zero. Great day for any indoor activities. Rainfall totals over the next few days could be anywhere from 2-6 inches across the area. This could prompt Flood or Flash Food Watches to be issued sometime later today. Looks like we dry out Sunday with cloudy conditions and highs in the mid 40s.